My favorite cigars cannot be simply described by brand, taste, construction, rarity or any other individual characteristic. And in my mind, my memory of a great smoke calls to mind the people and the experience more than the actual tobacco being smoked. Nonetheless, it is instructive to recall sitting in a rocking chair on an old friend’s front porch enjoying a Cohiba Gran Reserva the day before their launch; a 16” culebra shared with friends at La Zorro y el Cuervo in Havana listening to Roberto Fonseca play his magic; a Partagás Sobresaliente on the terrace of the Lanesborough in London; the Partagás Lusitania Gran Reserva smoked at the launch of my book in Havana two days before their introduction to the rest of the world. 1955 Ramón Allones Aristocrat In the dungeons of J.J. Fox in Dublin, I was treated to a 1955 Ramón Allones Aristocrat. This cigar was in pristine condition, never having left the humidity controlled environment since it was received as new inventory. The construction and burn was perfect. The flavor was floral and sweet. Paired with a rare Irish whiskey and good friends, made this truly a memorable hour. 1970’s Romeo y Julieta Clemenceau Enjoying the final dinner of the Amicigar event in a medieval fort extending over the water with the breathtaking coastline on either side of us, I was seated at the same table as Ajay Patel from LCDH London who presented me with a Hoyo de Monterrey Churchill from the 1980s. 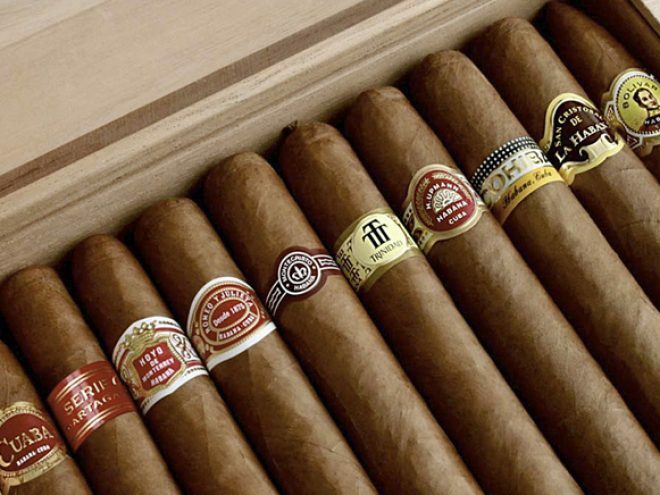 Other cigars tasted at the table included a 1970’s Romeo y Julieta Clemenceau and, from the holy trinity, a Habanos 1492. The Clemenceau was the most outstanding of the bunch. Diplomatic Trinidad I have often declared my admiration of the original release of the Trinidad Fundadores. Many years ago, a package was delivered that contained two diplomatic Trinidads. Now, these cigars were never available commercially, so this was an extremely rare treat. Especially, as they arrived unannounced as a gift from another old friend, Mitch. I treasured these sticks and finally smoked one while sitting alone, atop a Roman aqueduct in the south of France on a glorious sunny day. 1998 H. Upmann Magnum 46 During the Habanos Festival in 1999, I was given an unbanded cigar to smoke and it quickly became one of my all-time favourites. It was a 1998 H. Upmann Magnum 46. At the time, this was not a common smoke. It seems they were all produced at either the Jose Martí factory or at La Corona. They would only reach shelves about three times a year. The combination of new friends, the atmosphere and a new cigar made this a memorable smoke (and it reinforces the fact that any cigar, not only the rarified, can become a truly memorable smoke). Dunhill Cabinetta In the summer of 2005, sitting in the dining room of an old friend in beautiful Stockholm, after a simple but delicious meal filled with laughter, my friend presented the after dinner smokes, Dunhill Cabinetta, to this day, the most memorable smoke I have had the honour of enjoying.